Dr David BeckDavid Beck left school in 1999 with very little qualifications. He worked as a milkman and bricklayer in Bolton for 10 years until, along with his wife and six children, David moved to Bangor to study for his first degree. 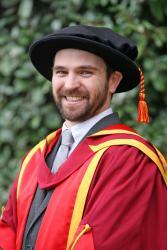 Today, David received a PhD in Sociology & Social Policy from Bangor University. David first studied an undergraduate degree in Human Geography, where he became interested in understanding peoples’ abilities to be able to source healthy food. Moving over to Social Sciences for a Master’s Degree, he developed an interest in understanding the rising issue of food poverty, and why people were starting to use the local food bank. Following this degree, David was offered the chance through a tuition fee bursary to continue his work with a PhD, again looking at the rise of food banks and, more importantly, how and why people are using them. During his studies, David has given expert evidence to various parliamentary committees including the Welsh Government on tackling poverty in Wales and the All-Party Parliamentary Inquiry into Hunger in the UK. 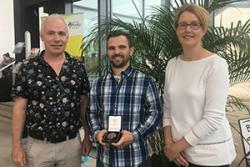 David receiving the Bronze Drapers' Medal: L-R: Dr Hefin Gwilym, Dr David Beck, Prof Carol TullyIn July, David was awarded a prestigious Bronze Drapers’ Medal for his outstanding work as a postgraduate student. David said: “My research into the increasing number of food banks across Wales came as a direct result from my time volunteering at the Cathedral Food Bank in Bangor. Listening to the stories of those people who have been left behind by a retrenching provision of social security, I have been truly humbled by their description regarding the circumstances, which have caused their food poverty. “Like many students, funding has always been my main and only issue. This study, although covered by a tuition fee bursary, did not come with any stipend or financial help, so I had to work full-time across four different jobs. On some occasions, my research hit home, as we also sometimes recognised this issue in our own house, as we struggled being on a low income. “After five years of unfunded full-time study it feels awesome to have finally finished the PhD.